Saturday 16th February - Anglian Water Open Day - Grafham Water Fishing Lodge. Saturday 4th May - Snowbee Interclub 'Floating Line' Competition - Grafham Water This is a National event fished in club teams of 4. Details and organisation - Invicta FFC, gary@howbuilders.fsnet.co.uk Tel Paul Stevens, Mob 07831 235069. This event was held at Drift Reservoir Penzance on Saturday 9th of May. Competitors travelled from as far as Oxfordshire and London to compete and after very wet and windy weather during the previous night anglers were met with light winds and sunshine for most of the day. 11 float tubers took part and enjoyed a successful day catching 81 trout, a mixture of Rainbow, Blue and Brown trout. It was a very close contest with 7 anglers all weighing in limit bags and only a couple of ounces separating them. The eventual winner was Steve Curnow of Long Rock with Peter Harris of Hayle 2nd and Dave Williams from St. Just 3rd. 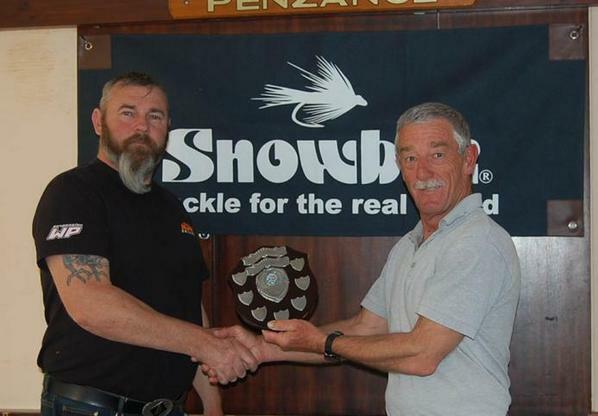 Steve was presented with the Snowbee Open Shield and Snowbee Fly line at the presentation held at Penzance Community Fire station, where the competitors enjoyed a well-earned Cornish Pasty too.